Curry Up for A Healthy New Beginning! Happy 2013! Hope everyone had a great holiday season and a fantastic new start. To kick things off the right way (and really to detox from a very meaty and sweet holiday) I finally decided to try and make a vegetarian dish. I said finally because I’ve always suffered from many food intolerances. In particular, barley, most legumes, and soy really makes it difficult to get the protein I need from a vegetarian diet. But it’s a new year and I’m willing to give it a shot. 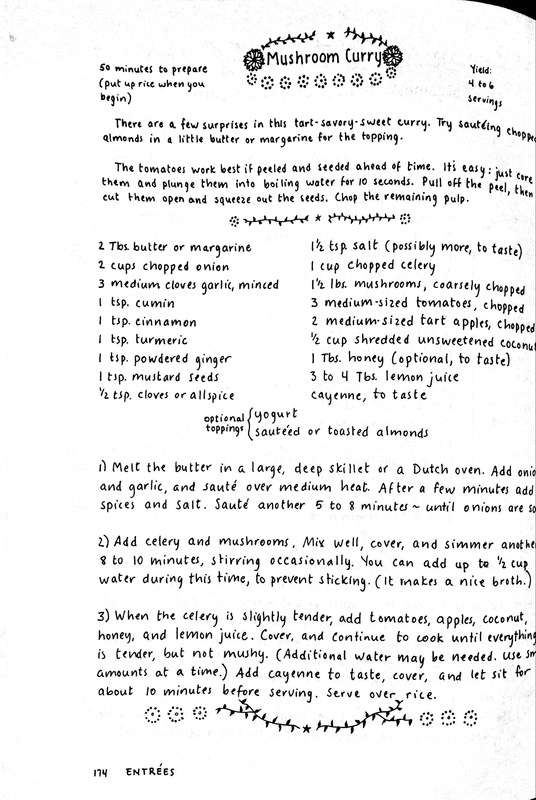 What better teacher than Mollie Katzen’s Moosewood cookbook? For those of you who have never seen the book itself, I definitely recommend checking it out. Aside from the delicious vegetarian recipes, the hand lettering aesthetics really makes it homey. 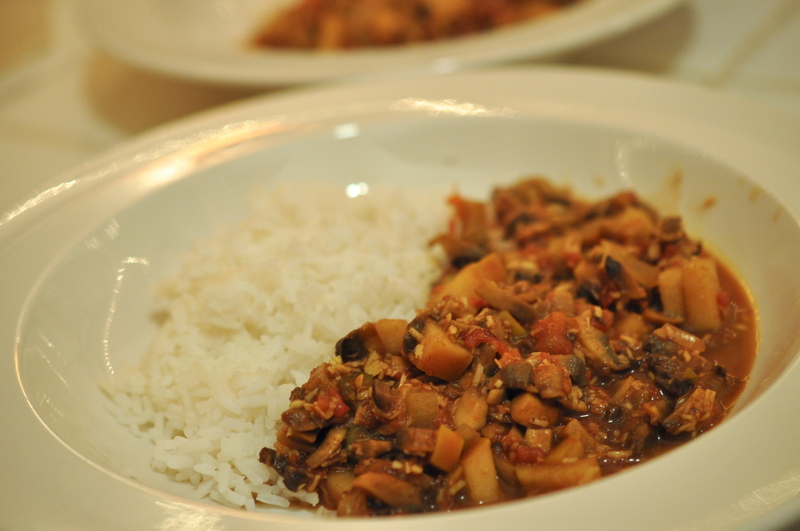 Flipping through the book, her Mushroom Curry caught my eye mostly due to the use of apples, lack of legumes and dairy. All the spices may seem daunting at first, but follow the recipe 100% and you’ll find making curry from scratch is really not too difficult! This recipe is definitely a winner. Aside from the seducing aroma, the Cremini mushrooms have the perfect “meaty” and creamy texture, celery a nice crunch, honey & coconut balances the tartness of the apples and tomatoes. To save time, you can use boxed or canned chopped tomatoes, I added the honey and water as suggested but decided to skip the yogurt topping as I found the dish tart enough on its own. Also see alternative serving suggestion below the recipe! Instead of serving this dish with rice, top a fried egg on a small bowl of curry and eat it with some toasted thick crusty bread on the side. Yummy! Stay tuned this week for more veggie soups! A perfect vegetarian dish for when I’m in a phase of lots of yoga and clean living.